This is not one of Detroit's gambling casinos. 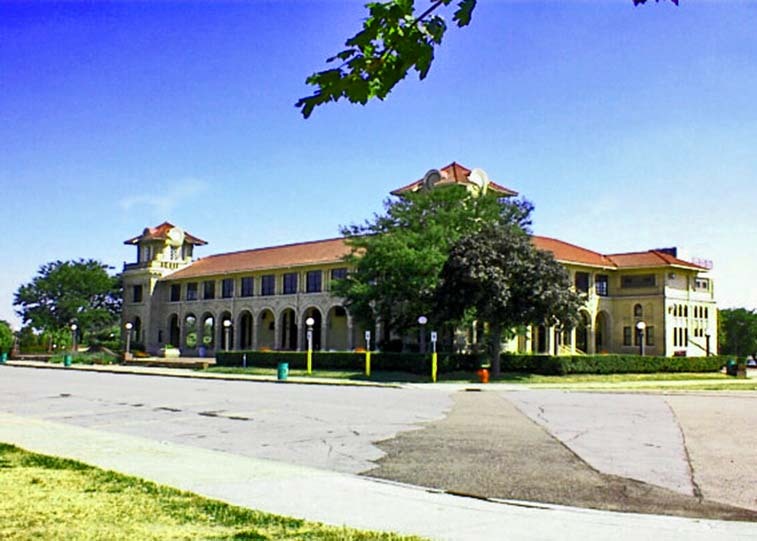 When Belle Isle was developed into one of the nation's most attractive urban parks, a Queen Anne-style casino building was erected in 1887. That gabled wood structure was designed by Mason and Rice. Similar to quite a few of the city's nineteenth century buildings, it was razed by fire. This is the building that was designed to replace the previous structure. It was designed it to provide views of the Detroit River and Canada, and to be an eating-place where patrons would be cooled by breezes in the era long before air conditioning. I do not know when the sale of food from this building ceased. For as long as I have been visitng Belle Isle, it has been more or less vacant. The state of Michigan rented Belle Isle from the city of Detroit in 2013, the first year of the city's brief bankruptcy. The state promised to invest twenty million dollars in capital improvements within about three years. I do not know what investments were made in the Casino. It may be rented for eight hours for $1500 and is used, from time to time, for weddings.